this might not be terribly interesting to some of you, but i’m fascinated (and not at all surprised) by this kind of stuff. 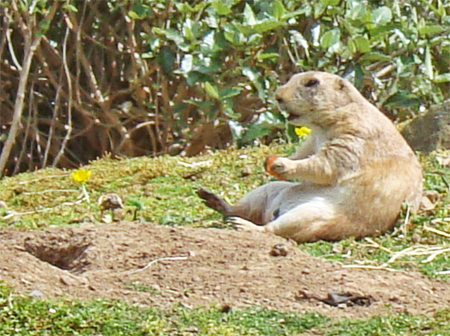 after reading up about it, i now subscribe to the [respected] theory that prairie dogs have a complex language consisting of unique and specific chirps/barks that they use to communicate. it appears that the prairie dogs are well within these parameters, and are quite possibly better at it than dolphins… and in some aspect(s), humans. here’s a BBC article about it but SURELY it’s not restricted to north american ones. This entry was posted in interesting and tagged animals, i learned something new, photos. Bookmark the permalink. I subscribe to BBC Knowledge Magazine and they just had an article about prairie dog language in this past issue. And an article about that doctor who freezes your brain while he does heart surgery. And an article about the Pinkerton’s. I was really smart for a few minutes! remember omni magazine? i LOVED them when i was a kid. they expanded my mind in a way that suwannee county couldn’t. back to my post, i think the thing that impressed me most about the prairie dogs is that, when presented with sthg they had never seen before (the black oval), they could coin a word… or rather a sound… that meant “black oval” and then when the researchers took the black oval to a completely separate and unrelated herd of prairie dogs, they used the same word!!! awesome.